In A Voyage To Cythera, a woman is thrust into helping a man to contact his beloved, and gains a glimpse of a world that fills her with a yearning as palpable as thirst. In Faithful Lovers an illicit couple reconnect, by a happenchance contrived by one if not both of them. In A Pyrrhic Victory, a young girl tries to disguise her passion for the beauty of her surroundings from her more cynical companions. In none of these tales does very much at all happen, as characters wrestle with apparently trivial conundrums they dare not voice, but this is the magic of Drabble’s writing. The details highlighted in her stories are selected with such care it’s as though they’ve been extracted from granite, then painstakingly polished to a gleam. A sardine tin is rashly dropped into a rock pool, a newly fixed lamp thrown against a wall: both acts of violence carried out by an otherwise sensible and level-headed woman. Female friendships, lust-riven affairs, a love of place and a desire for professional excellence are all illuminated here. This is a book of rational women for the most part long suppressing a torrent of emotions, which will inevitably blaze out at some unforeseen moment, at which point all those around her will recoil and say, Well, where on earth did that come from? There is a sly humour rippling through the scenes conjured by Drabble, an acknowledgement to women of the layers we each comprise, and a whisper to the rest of the world that could really be taken as a warning. What happens on the surface barely hints at the turmoil, and strength, beneath. Ignore that fact at your peril. 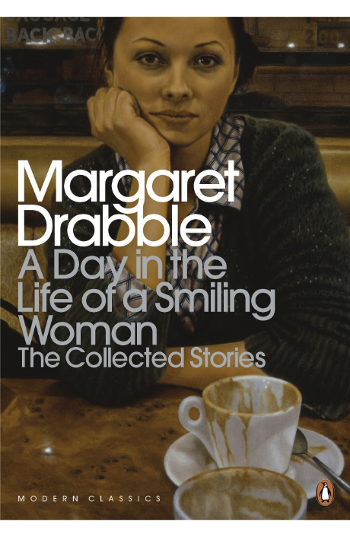 A Day in the Life of a Smiling Woman: The Collected Short Stories by Margaret Drabble is published by Penguin Modern Classics and is available to buy from Amazon. This entry was posted in Reviews and tagged A Day in the Life of a Smiling Woman, Book reviews, Margaret Drabble, short story collections by Judy. Bookmark the permalink.